My Favorite Electronics - Spencer S F Hello. Welcome to my website!!!! Right now I have an iPod that just plays. It is black, and you can't control what song you're on. But at least it's an iPod. 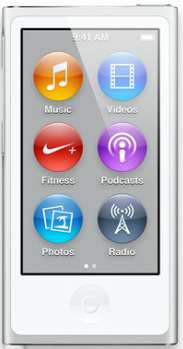 I'm thinking of getting a new one, though, an iPod Nano, 7th generation , as shown at left. I have a Nook Simple Touch (as shown at left) that is black and white and has a touch screen. You can buy eBooks on it and you can message back and forth with your friends who have nooks.